In the previous article (http://ponnadi.blogspot.in/2013/06/anthimopaya-nishtai-11.html), we observed the divine attitude of embAr and a few other incidents. In this article, it is established that AchAryan is an avathAram of bhagavAn and he should be treated as such only. purushArtham (utlimate goal for a jIvAthmA) is of four types. Even though the first 3 are considered to be part of purushArtham (ultimate goal), unless we achieve prathyaksha sAkshAthkAram, the other 3 are of not any real use. Only we directly see the ultimate goal, the other 3 are not accomplished. Of the last 2, since archAvathAra emperumAns dont interact personally with everyone, archAvathAram is also to be compared to other forms of emperumAn. After going through all sAsthrams, it is clearly determined that, for a jIvAthmA to become a muktha, only an AchAryan can make that happen by bestowing him the divine knowledge. So, that which bestows gyAnam must be the ultimate goal also. And that which is the ultimate goal must also be the upAyam (means). So, kainkaryam for AchAryan is the ultimate goal. Since, nammAzhwAr who was blessed with blemishless knowledge by bhagavAn himself declares that bhagavAn who blessed him blemishless knowledge is his ultimate object of worship, AchAryan who blesses the sishya with divine knowledge is the only means for him. All other upAyams are like upAyAntharams (other means which are to be given up). nanjIyar explains this to nampiLLai in thirumudikkuRai rahasyam - since without this prathyaksha sAkshAthkAram (direct divine vision of AchAryan) there is no possibility of bestowing mOksham, AchAryathvam is the ultimate upAyam. AchArya abimAnamAvathu ivaiyonRukkum sakthananRikkE iruppAnoruuvanaik kuRiththu ivanudaiya izhavaiyum, ivanaippeRRAl Iswaranukku uNdAna prIthiyaiyum anusandhiththu, sthanandhayaprajaikku vyAthi uNdAnAl than kuRaiyAga ninaiththuth thAn aushadha sEvai paNNi rakshikkum mAthAvaippOlE ivanukkuththAn upAyAnushtAnam paNNi rakshikka valla paramadhayALuvAna mahAbAgavatha abhimAnaththilE odhungi, "vallaparisu varuvipparEl athu kANdumE" engiRapadiyE sakala nivruththi pravruththigaLum avanitta vazhakkAy. Simple translation: AchArya abhimAnam means - For a jIvAthmA who has no ability to perform any other upAyam (karma, gyAna, bhakthi, prapathi), the AchAryan looking at the great loss for the jIvAthmA (due to the jIvAthmA not realizing the connection with emperumAn) and looking at the joy of Ishwaran when he gets the jIvAthmA (as his pure servitor), just like a mother will consume medicine when the breast-fed child becomes ill thinking that she herself has become ill, AchArya himself performs sharaNAgathi on behalf of the sishya to emperumAn. A sishya should fully keep himself at the disposal of such pure bhAgavatha who is most merciful and wait for the benediction of bhagavAn thinking that "if bhagavAn feels committed to the AchAryan (which he will) let him come and bless me" (As identified by ANdAL nAchiyAr in nAchiyAr thirumozhi). It is very clear that piLLai lOkAchAryar is an incarnation of our pEraruLALan (kAnchi dhEva perumAL) as directly seen by maNaRppAkkathu nambi. This incident (of piLLai lOkAchAryar being an incarnation of dhEva perumAL) is explained clearly by jIyar (mAmunigaL) in his vyAkyAnam (avathArikai) for srIvachana bhUshaNam. Further, there are so many more beautiful explanations relating to sadhAchArya-sathsishya lakshaNam that are explained by our jIyar (mAmunigaL). I am not elaborating on these fearing about this grantham becoming too big. AzhwArs such as prapanna jana kUtasthar parAngusa (nammAzhwAr), parakAla (thirumangai AzhwAr), bhattanAtha (periyAzhwAr), etc., who are able to visualize both spiritual and material worlds of bhagavAn perfectly, who revealed the essence of all the vEdhams/vEdhAnthams through their dhrAvida brahmavidhyai and made them available for everyone irrespective of birth, age, etc. Simple translation: srIman nArAyaNan himself who is the supreme god, out of his divine mercy takes up a humanly form to uplift the jIvAthmAs of this world with the help of sAsthram in his hands (as AchAryan). So far, we have seen that a true sishya should worship his true AchArya who is a special incarnation of emperumAn through many pramANams (proofs). Now, we will see some pramANams to establish that we should not treat the AchAryan like a common man. With these two, it is established that, the ones who treat their AchArya as a common man will fall into hellish regions and the one who worships the AchAryan as bhagavAn himself will be uplifted to paramapadham. Since aruLALa perumAL emperumAnAr says in gyAna sAram 32 "ekkAlum naNNiduvar kIzhAm naragu" (எக்காலும் நண்ணிடுவர் கீழாம் நரகு - one who considers his AchArya as a simple mortal human being, will fall down into the hellish planets eternally) such thoughts should be completely given up and we should think that "pIthakavAdaip pirAnAr biramaguruvAgivandhu" (பீதகவாடைப் பிரானார் பிரமகுருவாகிவந்து - bhagavan has himself appeared as the AchAryan) as said by periyAzhwAr. This principle will be deep rooted in the hearts of the ones who are most faithful to sAsthram and act according to pramANams always. thaithriya upanishadh - yathO vAchO nivarththanthE aprApya manasA saha (யதோ வாசோ நிவர்த்தந்தே அப்ராப்ய மநஸா ஸஹ) - bhagavAn's one guNam itself is not understandable by the mind and explainable by words even for the most intelligent person imaginable. 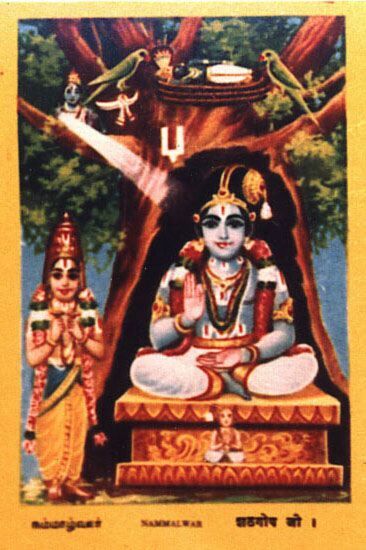 He is explained as most difficult to achieve, common for both binding the jIvAthmA in samsAram and liberating the jIvAthmA from samsAram, is cruel at times that he pushed bharathan who was totally surrendered and sIthA pirAtti who is inseparable from perumAL like fish and water, into forest to live in separation, he explains prapathi to arjunan, etc., but still engages them in his leelai, etc. svAbimAnaththAlE IswarAbhimAnaththaik kulaiththukkoNda ivanukku AchAryAbimAnamozhiya gathiyillai enRu piLLai palakAlum aruLichcheyyak kEttirukkaiyAyirukkum. ஸ்வாபிமானத்தாலே ஈஸ்வராபிமானத்தைக் குலைத்துக்கொண்ட இவனுக்கு ஆசார்யாபிமானமொழிய கதியில்லை என்று பிள்ளை பலகாலும் அருளிச்செய்யக் கேட்டிருக்கையாயிருக்கும். Simple translation: I have heard from vadakku thiruvIdhip piLLai very often that, for the jIvAthmA who out of his independence lost the mercy of Iswaran, AchAryan's mercy is the only refuge. samsArAvarththa vEga prasamana subadhruk dhEsika prEkshi - thOham (ஸம்ஸாராவர்த்த வேக ப்ரசமன ஸுபத்ருக் தேசிக ப்ரேக்ஷி - தோஹம்) - I am well because I look to my AchAryan to quell the might of the effects of samsAra. pramEya sAram 1 - ...ivvARu kEttiruppArkku ALenRu kaNdiruppAr mItchiyilA nAttiruppAr enRiruppan nAn (...இவ்வாறு கேட்டிருப்பார்க்கு ஆளென்று கண்டிருப்பார் மீட்சியிலா நாட்டிருப்பார் என்றிருப்பன் நான்) - Ones who heard the meanings of thirumanthram and understood bhAgavatha sEshathvam from an AchAryan and serve him, will surely reach paramapadham which is the ultimate destination of no return. upadhEsa rathina mAlai 72 - ...iruL tharumA gyAlaththE inbamuRRu vAzhum theruL tharumA dhEsikanaich chErnthu (...இருள் தருமா ஞாலத்தே இன்பமுற்று வாழும் தெருள் தருமா தேசிகனைச் சேர்ந்து) - By listening and following the divine instructions of pUrvAchAryas and their lives and accepting an AchAryan who blesses divine knowledge to the sishyan, the sishyan can live happily even in this samsAram which is filled with darkness. It is due to this reason, periyavAchAn piLLai clearly concludes that there is nothing greater than considering AchArya's lotus feet as both material/spirtiual worlds and accepting him as visible/invisible goal. But does it mean that for such sishyas (who have total faith in their AchArya) samsAram itself becomes paramapadham? Once, nambi thiruvazhudhi vaLanAdu dhAsar recites kaNNinuN chiruthAmbu and concludes with "madhurakavi sonnasol nambuvAr pathi vaikuntham kANminE" (மதுரகவி சொன்னசொல் நம்புவார் பதி வைகுந்தம் காண்மினே - One who believes in the divine words of madhurakavi AzhwAr, wherever they stay that place becomes vaikutham). At that time, the srIvaishNavas there ask him "If a srIvaishNava in this samsAram (leelA vibhUthi) faithfully recites, how does that place become vaikuntham (nithya vibhUthi)?" and he replies "Listen to me - I will explain how. After the appearance of the divine son of kUrathAzhwAn (bhattar), the barrier in between the two worlds was destroyed and both became one" - this incident is explained in kaNNinuN chiruthAmbu vyAkyAnam. Translator's note: Thus, we have seen how AchAryan is the most merciful incarnation of bhagavAn himself and serving him is the most important aspect for a sishya. Thanks to srI ranganAthan swamy for helping out in translating some of the samskritha pramANams. 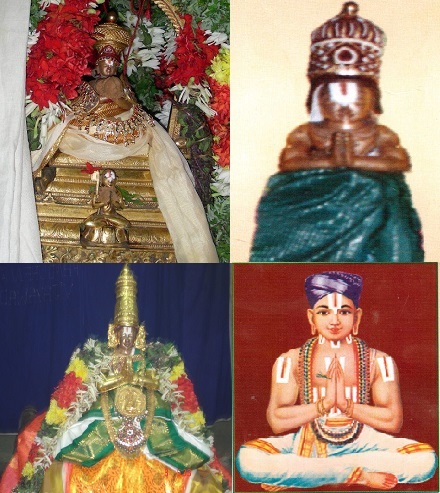 In the previous article (http://ponnadi.blogspot.in/2013/06/anthimopaya-nishtai-10.html), we observed the divine glories of srI rAmAnuja's sishyas. We will continue with more such incidents (mainly embAr's nishtai) in this article. embAr (gOvindhar) was born in vattamaNi kulam (a particular family lineage) and was most knowledgable, very detached and was following anushtAnams properly even at a young age. At that time, he became a devotee of shiva, entered in to saiva Agamam, wore rudhrAksha mAlai and went to kALahasthi. There he became the chief priest and controller of the shiva temple. He was having sticks/leafs in hands (which are pleasing to shiva) and was constantly singing the glories of shiva being an expert in thamizh language. At that time, periya thirumalai nambi (srI saila pUrNar) arrives at kALahasthi for a particular reason (to reform gOvindhar) from thirumalai. He sits along with his sishyas in a wooded area (forest) and starts discussing with his sishyas. At the same time, embAr arrives into the same area to pluck flowers for rudhran and he starts climbing on a tree near where thirumalai nambi was sitting. Seeing embAr's state, thirumalai nambi feels very sorry for him and thinks "Since this jIvAthmA (embAr) is a great vidhwAn and very detached person, if he gives up his devotion for what is not meant for the jIvAthmA and that is very lowly and becomes a devotee of srIman nArAyaNa who is the most apt master for the jIvAthmA, it will be most beneficial for the whole world". He then goes right close to the tree where embAr was picking flowers and starts explaining vEdhAntha verses which establishes the supremacy of srIman nArAyaNa and discusses the same with his sishyas. embAr, forgetting his services at the temple and the plucking of flowers, starts listening the divine words of thirumalai nambi and becomes very ecstatic and stays there for a long time. Seeing embAr's favourable attitude, nambi thinks "Let us explain a pAsuram from the divine srIsUkthis of nammAzhwAr to purify his mind" and starts explaining the following pAsuram from thiruvAimozhi (2.2.4) in great detail. Simple translation: emperumAn created brahmA to perform vyashti srushti, i.e., to create all beings and variety of aspects (bhagavAn first does samashti srushti himself directly - where he creates upto pancha bhUthams and performs vyashti srushti indirectly through brahmA). Apart from emperumAn, is any one else qualified to accept flowers and prayers? (No one else is qualified). Hearing this, since embAr is an expert in thamizh, he at once drops the flower basket and climbs down the tree claiming "No! No!" and says "I have wasted so much time in my life serving this dhEvathai who is filled with thamO guNam by regularly bring water for his bathing, etc" and falls at the lotus feet of thirumalai nambi. nambi, being pleased that his objective was fulfilled, instructs embAr to purify himself by bathing. embAr throws his rudhrAkhsha mAlais and remvoves off his pAshaNdi vEsham, bathes and returns with the wet cloth with great desire to accept nambi as his AchArya. nambi becomes very pleased with him and at once performs pancha samskAram to him, explains him clearly thyAjyam (what is to be given up) and upAdhEyam (what is to be accepted) and instructs "give up all attachments to every thing other than bhagavAn, hold on to srIman nArAyaNan and stay faithful towards our dharisanam". embAr accepts that with gratitude and starts leaving to thirumalai with nambi. At that time, many pAshaNdis of kALahasthi arrives there and says to embAr "You are our chief so you cannot leave us" and embAr replies from a distance "Hold on to your sticks and leaves; I wont be in this graveyard any more". Just like sIthA pirAtti left lankA without any attachment towards that place and like mukthAthmAs travel in archirAdhi gathi towards paramapadham with the guidance of hArdhan (a form of emperumAn), embAr goes to thirumalai which is considered as bhUlOka vaikuntam with the guidance of thirumalai nambi, stays there as a close confidante of thirumalai nambi and serves him always. 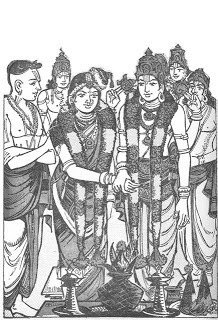 udayavar arrives to thirumalai (thiruppathi) and learns the essential principles of srIrAmAyaNam from thirumalai nambi and plans to return to srIrangam. Considering srI rAmAnuja as a special incarnation and seeing him as ALavandhAr himself, thirumalai nambi asks his sons to take shelter of udayavar and tells him "I still want to offer you something valuable". udayavar, seeing embAr's devotion towards his AchArya, requests nambi to bless him by sending embAr with him to srIrangam. nambi happily accepts the request and hands over embAr through the process of udhagadhArA (using holy water to donate so that the transaction is complete). embAr leaves with udayavar and travels for 4/5 days and starts sulking due to separation from nambi (his AchArya). udayavar asks embAr "Why are you so sad?" and says "If you are unable to deal with separation from your AchArya, you return to thiruvEngadam". embAr happily travels back 4/5 days and reaches the thirumALigai (residence) of thirumalai nambi and falls at his lotus feet. nambi says to embAr "I have given you to udayavar by the udhagadhArA process. Why did you return here now?" and embAr explains that he was unable to bear the separation from him. nambi says "We cannot feed a cow that was sold to some one else. Now you should be totally surrendered to udayavar and serve him" and pushes him out without even offering some prasAdham to embAr. Realising his AchArya's intentions, embAr decides that udayavar's lotus feet are the only refuge and returns to srIrangam. He serves udayavar happily and stays there since then. Once in an assembly where udayavar and his sishyas were present, udayavar's sishyas start glorifying embAr's gyAnam, bhakthi, vairAgyam, etc. embAr nods his head in acceptance saying "Yes! that is correct" and glorifies himself more than others. Seeing that, udayavar says "If others glorify you, you should be very humble and say that you are not worthy of their praise. Instead you are glorifying yourself. Is this proper etiquette?" and embAr replies "swamy! if these srIvaishNavas glorify me - I am truly worthy of being glorified only for staying in kALahasthi with the lowly form of stick and pot in hand, rudhrAksha mAlai on my neck, etc. But, your highness have done so much favours in purifying me as said in 'pIthagavAdaippirAnAr biramaguruvAy vanthu' (பீதகவாடைப்பிரானார் பிரமகுருவாய் வந்து - bhagavAn himself appears as the first guru). I was so fallen - more fallen than a nithya samsAri - but you have changed me such that these srIvaishNavas glorify me. So, everytime I or some one glorifies me, that really means your highness is being glorified". udayavar says "Dear gOvindha perumAL! fantastic! fantastic!" and becomes very pleased seeing embAr's nishtai. A sishya of nanjIyar who lives in a different place visits nanjIyar and serves him for some time. He then decides to return back to his town. A close confidante (sishya) of nanIyar notices this srIvaishNava returning back and tells him with sorrow "Oh! its unfortunate that you have to leave jIyar's lotus feet and return to your residence" and that srIvaishNava replies "Wherever I am, I still have the mercy of my AchArya" and consoles himself. A srIvaihNavi (close confidante sishyai of nanjIyar) hears this conversation, observes that the srIvaishNava who is returning home is not anguished about the separation from his AchAryan and says "Enaththu uruvAy ulagidandha UzhiyAn pAdham maruvAdhArkku uNdAmO vAn?" (ஏனத்து உருவாய் உலகிடந்த ஊழியான் பாதம் மருவாதார்க்கு உண்டாமோ வான்? - mudhal thiruvanthAdhi 91 - If one does not worship the lotus feet of varAha perumAL who rescued earth, how will he reach paramapadham? - The context is - if this is said about emperumAn's lotus feet itself, what to speak of not worshipping AchArya's lotus feet every day). This incident is narrated by my AchAryan (mAmunigaL). From this, we can understand that if the sishya moves away from his sadhAchArya, he will not know what it is to be accepted and what is to be rejected. Then, ignorance will consume him and will not accomplish the ultimate result of reaching paramapadham. When kongunAdu (coimbatore region) was affected by drought, a brAhmaNa and his wife comes to srIrangam to live there. Those days, emperumAnAr would perform mAdhukaram (beg for food) in 7 houses. When he walks on the streets, near agaLanganAttAzhwAn prAkAram (one of the seven layers around the temple), all the srIvaishNavas would bow down at the lotus feet of emperumAnAr. The brAhmaNa and his wife would watch that from their house upstairs in that neighbourhood. One day, emperumAnAr visits their house and the woman steps down from upstairs. She asks emperumAnAr "All the kings are bowing down at your lotus feet; But here you are begging for food. What is the reason for this?" and emperumAnAr responds "Since I give them good instructions they are worshipping me". She bows down at his lotus feet and asks "Please give those good instructions to me as well". emperumAnAr out of his divine grace instructs her (the dhvaya mahA manthram) at once. Subsequently, normalcy returns to their native land and they prepare to leave srIrangam. The lady becomes worried that she may not be able to meet emperumAnAr again before leaving. At that time, emperumAnAr arrives there for mAdhukaram and she tells him "We are returning to our native place; Please repeat those divine instructions again to me so that it stays deep-rooted in my heart". emperumAnAr mercifully gives her those same instructions once more. She again asks "Please bless me something more to protect myself always". udayavar immediately removes his pAdhukAs (sandals) gives them to that lady who is named periya pirAttiyAr. From that day onwards, she kept those pAdhukAs in her thiruvArAdhanam and worshipped them with love. This incident is well known from vArthAmAlai. From this we understand that, In this samsAram people will even ignore emperumAn - in such case it is rare to develop total devotion towards AchAryan and accepting something related to that AchAryan (like the pAdhukAs in this case) as total refuge. Such people who have developed faith in AchArya should be like periypirAttiyAr of kongu dhEsam. We can also remember the lives of ponnAchiyAr (wife of piLLai uRangA villi dhAsar), thumbiyUrk koNdi, Ekalavyan, vikramAdhityhyan who were all AchArya nishtars. Translator's note: Thus, we have seen the nishtai of embAr and other sishyas of udayavar how they manifested total dependence on srI rAmAnuja. In the previous article (http://ponnadi.blogspot.in/2013/06/anthimopaya-nishtai-9.html), we observed the divine glories of nampiLLai in this article. We will continue with more incidents from various sishyas of emperumAnAr in this article. Once during the times of udayavar, aruLALa perumAL emperumAnAr was ill. kUrathAzhwAn did not go and enquire about his illness immediately and goes to meet him after 4 days and asks him "How did you manage when you were ill?" and aruLALa perumAL emperumAnAr responds "For the level of our friendship between yourself and me, I thought you would come and meet me and bless me as soon as you heard about my illness. But you have ignored me and I am deeply hurt. This will not heal until I go and worship the lotus feet of ALavandhAr". This incident is explained in ponnaulAgALIrO (thiruvAimozhi 6.8.1) pAsuram vyAkyAnam clearly. (Translator's note: The context here is, in ponnulagALIrO padhigam, nammAzhwAr sends a bird as the messenger to emperumAn and he has utmost confidence that the bird is fully capable of even having emperumAn at his disposal. But the bird is not helping AzhwAr immediately. Similarly, aruLALa perumAL emperumAnAr knowing that AzhwAn has emperumAn at his disposal and could even have got him paramapadham immediately but he showed up after a long delay. So, he is saying, that feeling will heal only when/if he reaches paramapadham and bow down at ALavandhAr who is already in paramapadham). vaduga nambi was alive for some time after udayavar's ascending to paramapadham. But, eventually he also ascends to paramapadham. One srIvaishNava goes to bhattar and tells him "vaduga nambi ascended to paramapadham". bhattar responds "You should not say like that for vaduga nambi". The srIvaishNava asks "Why not? Cant we say that he ascended to paramapadham?". bhattar beautifully explains that paramapadham is common for prapannas and upAsakas (ones who undergoes bhakthi yOgam and achieves paramapadham by their self effort) - vaduga nambi's focus is not that. Then, the srIvaishNava asks "So, does he have some other place in his mind?" and bhattar explains "Yes. You should say vaduga nambi reached the lotus feet of emperumAnAr" - this is explained by my AchAryan (mAmunigaL). ALavandhAr declares in the beginning of sthOthra rathnam "athra parathrachApi nithyam yadhIya charaNau sharaNam madhIyam" (அத்ர பரத்ரசாபி நித்யம் யதீய சரணௌ சரணம் மதீயம் - Both in samsAram and paramapadham I always want to serve nAthamunigaL's lotus feet). thiruvarangathu amudhanAr says in rAmAnusa nURRanthAdhi 95th pAsuram "viNNin thalai ninRu vIdaLippAn emmirAmAnusan maNNin thalaththudhiththu maRai nAlum vaLarththananE" (விண்ணின் தலை நின்று வீடளிப்பான் எம்மிராமானுசன் மண்ணின் தலத்துதித்து மறை நாலும் வளர்த்தனனே - From paramapadham our rAmAnuja will will bless the jIvAthmas with the ultimate goal of kainkaryam in paramapadham and while he took birth in this samsAram, without being touched by the defects of this samsAram, he would establish the vEdha sAsthram properly). The all knowing aruLALa perumAL emperumAnAr, bhattar who is the son of kUrathAzhwAn, paramAchAryar ALavandhAr, thiruvarangathu amudhanAr who fully brought out the divine glories of udayavar, kUrathAzhwAn, etc., have all clearly explained the glories of AchArya nishtai. Thus it is established that total dependence on the lotus feet of AchArya who is uncomparable master for the sishya in both samsAram and paramapadham is far greater than total dependence on the lotus feet of bhagavAn which are said to be equal to all as said in jithanthE sthOthram as "dhEvAnAm dhAnavAncha sAmAnyam adhidhaivatham" (தேவாநாம் தாநவாஞ்ச ஸாமாந்யம் அதிதைவதம் - bhagavAn is common to all beings). This is why mAmunigaL also prayed towards emperumAnAr as in "When will I attain your lotus feet? ", "yathirAja! please always engage me with pleasure in your service". Our jIyar explains the following incident. Once a srIvaishNava was eating prasAdham and kidAmbi AchAn was serving him water. But instead of serving it straight from the opposite side, he was doing it from the sides and because of that the srIvaishNava had to bend his neck a bit to accept the water. udayavar observed that, and pushes kidAmbi AchAn on his spine (back) and tells him "we must serve srIvaishNavas with utmost care". Hearing that kidAmbi AchAn becomes ecstatic and says "You are clearing my defects and engaging me more in service and I am very grateful for such mercy" and shows his gratitude. In mAnikka mAlai, periyavAchAn piLLai identifies the following incident. Once, udayavar becomes upset with AzhwAn. A few who were present there asks AzhwAn "Now that udayavar has pushed you away, What are you thinking now?" and AzhwAn responds "Since I am completely subservient to srI bhAshyakArar, I will accept whatever he does - nothing to worry". The following incident is identified in vArthA mAlai. piLLai uRangA villi dhAsar once goes to mudhaliyANdAn, bows at his lotus feet and asks "How should a sishya be towards his AchArya?" and ANdAn says "For the AchAryan, sishya should be like a wife, the body and an attribute - i.e., a wife will do whatever the husband tells her, a body will do whatever the AthmA wants and will be borne by the object". piLLai uRangA villi dhAsar then goes to AzhwAn and asks him "How should a AchArya be towards his sishya?" and AzhwAn responds "For the sishyan, AchArya should like the husband, the AthmA and the object - i.e., like a husband who properly instructs the wife, like the AthmA who control the body as he feels and as the object which bears the attribute". Once, kUrathAzhwAn and mudhaliyANdAn were have a discussion on divine matters and a topic comes up "Are we blessed the ultimate goal of mOksham by svAnuvruthi prasannAchAryan (an AchArya who puts through the sishya several stringent tests before blessing him with divine knowledge) or krupAmAthra prasannAchArya (an AchAray who blesses the sishya with divine knowledge based on the pure desire in the sishya)?". ANdAn says "mOksham is through svAnuvruthi prasannAchArya only" and AzhwAn says "mOksham is through krupAmAthra prasannAchAryan only". ANdAn says since periyAzhwAr says "kuRRaminRi guNam perukki gurukkaLukku anukUlarAy" (குற்றமின்றி குணம் பெருக்கி குருக்களுக்கு அனுகூலராய் - One should remove the defects and act favourable towards their AchArya), we should also do that. AzhwAn say "Its not like that", as madhurakavi AzhwAr says "payananRAgilum pAngallarAgilum seyal nanRAgath thiruththip paNikoLvAn kuyil ninRAr pozhil sUzh kurugUr nambi" ( பயனன்றாகிலும் பாங்கல்லராகிலும் செயல் நன்றாகத் திருத்திப் பணிகொள்வான் குயில் நின்றார் பொழில் சூழ் குருகூர் நம்பி - Even if we are not qualified and matured enough, nammAzhwAr who lives in AzhwAr thirunagari which is surrounded by gardens, will purify us and engage us in his service) we should not try to do it on our own and instead we should depend on the mercy of the AchArya to achieve the highest goal of mOksham. Hearing that ANdAn was very pleased. This incident was narrated by my AchAryan (mAmunigaL). udayavar out of his divine mercy, travelled to thirunArAyaNapuram citing kirumikaNdan (saiva king) as a reason. Since the temple kainkaryaparars were suffering due to that, thinking "We are facing these problems due to udayavar only, so any one who is related to udayavar should not enter the temple", an order was placed to such effect. kUrathAzhwAn went to the kirumi kaNdan's court to establish our sidhAntham and lost his eyes and finally returns to srIrangam. Without knowing the situation at the temple, he goes to worship periya perumAL and one of the gate keepers stops AzhwAn. But at the same time another gate keeper asks AzhwAn to enter the temple. AzhwAn was surprised to hear the two different views of the gate keepers and asks them "What is happening here?". They reply "There is an order which says we should not allow any one related to emperumAnAr inside the temple". AzhwAn asks "But why are you allowing me then?". They reply "AzhwAn! Unlike others you are very good hearted with Athma guNams, so we allowed you to enter the temple". Hearing this AzhwAn becomes shocked and starts shivering like a moon in the water (which constantly shakes). He steps back a few steps and says "sAsthram says one develops Athma guNams lead to AchArya sambandham (relationship); But here in my case, Athma guNams are leading to give up my relationship with emperumAnAr" with deep sorrow. He further says "For me, emperumAnAr's lotus feet is sufficient to achieve the ultimate goal; I dont need to worship perumAL giving up emperumAnAr's relationship" and returns to his thirumALigai (residence) without worshipping emperumAn. This incident is narrated by our jIyar. It is explained in thiruvirutham vyAkyAnam that ALavandhAr identifies that emperumAn out of his mercy, himself appeared as nammAzhwAr. 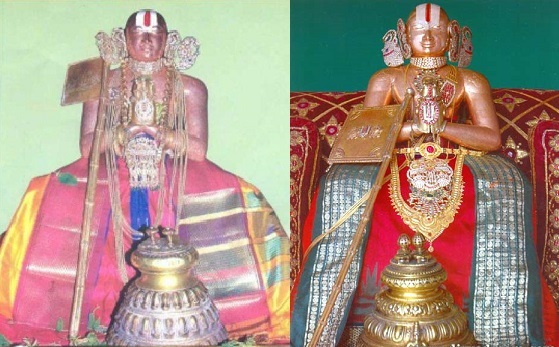 azhagiya maNavALa perumAL nAyanAr in his AchArya hrudhayam also wonders if nammAzhwAr is the avathAram for kali yugam in chathurtha varNam after being born as the son of athri, jamadhagni, dasaratha and vasudhEvan/nandhagOpAlan in brAmaNa/kshathriya/vaishya varNams in previous yugams (sath, trEtha, dhvApara yugams). (Translator's note: AzhwAr's glories makes everyone wonder if he is emperumAn's avathAram, but he is really not as explained by our pUrvAchAryas clearly. The context here is to show that emperumAn himself wants to take the position of AchAryan since that is the highest position one can depend on). Translator's note: Thus, we have seen the nishtai of various sishyas of srI rAmAnuja and how they manifested total dependence on srI rAmAnuja. In the previous article (http://ponnadi.blogspot.in/2013/06/anthimopaya-nishtai-8.html), we observed the most wonderful incident in the lives of our pUrvAchAryas, i.e., srIranganAthan accepting mAmunigaL as his AchAryan and submitting srIsailEsa dhayApAthram thaniyan for him and propagating the same to all dhivyadhEsams. We will continue to observe the divine glories of nampiLLai in this article. One day, after nampiLLai completes bhagavath vishaya kAlakshEpam and every one leaves, pinbhazhagiya perumAL jIyar bows in front of nampiLLai and asks him "Please explain to me the true nature of me (jIvAthmA), the means and the ultimate goal". nampiLLai replies "emperumAn's/emperumAnAr's desire to uplift the jIvAthmA is that which sustains the jIvAthmA, their mercy is the means and the blissful service to them is the ultimate goal". jIyar responds "I dont think like that". nampiLLai says "Do you have a separate route? Please reveal your mind". jIyar says "My nature is to be surrendered to the srIvaishNavas who are surrendered unto your lotus feet, their mercy is my means and the happiness in their divine face is my ultimate goal". nampiLLai becomes very pleased with jIyar's words. During nampiLLai's days, mudhaliyANdAn's grand son kanthAdai thOzhappar was jealous seeing nampiLLai's glories. Once when thOzhappar was in the temple worshipping periya perumAL, nampiLLai arrives there at the same time with many of his disciples. Without any reason and purely out of his jealousy, thOzhappar shouts at nampiLLai and insults him. Hearing that nampiLLai becomes afraid of the consequences, quickly worships periya perumAL and returns to his thirumALigai (residence). Hearing this incident, thOzhappar's wife who is very knowledgable, becomes very worried about her husband's offenses towards nampiLLai and stops all her kainkaryams at home and waits for her husband. When thOzhappar arrives and observes that his wife does not welcome him and serve him as she does usually when returning home from outside, he asks her "Since the day I married you, you considered me as your AchAryan and served me well. But today you are ignoring me completely. What is the reason?" and she responds "dear swamy! You have insulted nampiLLai who is re-incarnation of thirumangai AzhwAr himself and who is most dear to periya perumAL in front of periya perumAL himself. You are not even feeling sorry for your actions. I have no relationship with you anymore. If you hate me and want to punish me, you can continue to punish my body which was given to you by my parents. I have already been uplifted when I took shelter of my AchAryan. Thus, I will have no relationship with you who have committed the greatest offense even after knowing bhagavAn's own words 'Even after many crores of births I wont forgive the ones who commit bhAgavatha apachAram'. So, I will lead my life on my own". Hearing this, thOzhappar becomes astonished for a while. But after contemplating her words, he realises his mistake since he was a great scholar and also being born in the great vamsam of mudhaliyANdAn. He says "Whatever you have said is correct. I have committed a big blunder. What can I do now?". She says "Dont search for something in the pond, when you lost it in the river". He asks "What do you mean?" and she responds "Since you have committed the offense against nampiLLai, go and fall at the lotus feet of the most merciful nampiLLai and ask for forgiveness from him. He will certainly forgive you and you will be relieved of your miseries". He then says "Since I have committed the greatest offense of insulting him right in front of periya perumAL, I feel so ashamed to go in front of him. Please accompany me and lead me to ask for forgiveness". She accepts and they both start leaving their place. Simple translation: kandhAdai thOzhappar who was very famous in srIrangam, out of great affection declared nampiLLai as lOkAchAryan. Since then, nampiLLai becomes famously known as lOkAchAryar and that name and fame stayed forever. nampiLLai's glories are boundless and can be understood from the following pAsuram and slOkams. Simple translation: By surrendering unto the lotus feet of nampiLLai who is the dear sishya of nanjIyar (who was feared by the mAyAvAdhis), I removed all the defects of my mind which will push me eternally into the hellish regions. Simple translation: I worship nanjIyar's sishya - nampiLLai's lotus feet . After hearing his glorious words, we will be purely situated in this glorious bhagavath anubhavam and will develop detachment towards both samsAram and srIvaikuNtam. Simple Translation: I worship sUkthi mahArNava (great ocean of divine words - nampiLLai) who is known as srImath kalidhvamsana dhAsar. After hearing his words in his lectures, we will consider his assembly is the best over any other assembly. vadakku thiruvIdhi piLLai and his wife (both of them are sishyas and close confidantes of nampiLLai) were totally detached from materialistic life and were serving nampiLLai everywhere, at all times and in all possible ways. One such day, nampiLLai visits vadakku thiruvIdhi piLLai's thirumALigai (residence) and everyone bows down at his lotus feet. At that time, vadakku thiruvIdhi piLLai's wife offers obeisances to nampiLLai, wearing a wet saree. nampiLLai asks the other ladies why she is wearing a wet saree. They reply that she has just purified herself after going through the menstrual cycle and accepting his blessings after such state. Being very pleased, nampiLLai invites her close, touches her stomach with his divine hands and blesses her "You will beget a son who is as glorious as myself". Seeing this, vadakku thiruvIdhi piLLai understands that begetting a child will be pleasing to his AchAryan and acts accordingly with his wife. Subsequently, she becomes pregnant and in a year she gives birth to a divine child. vadakku thiruvIdhi piLLai names him with nampiLLai's divine name "lOkAchAryar" (who becomes to be famously known as piLLai lOkAchAryar) and shows his gratitude towards his AchAryan. 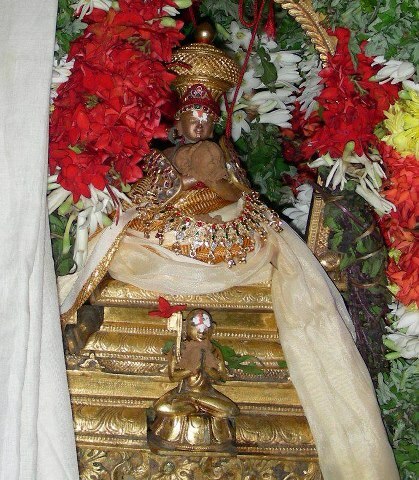 Thus, vadakku thiruvIdhi piLLai's son piLLai lOkAchAryar was born out of the divine blessings of nampiLLai. 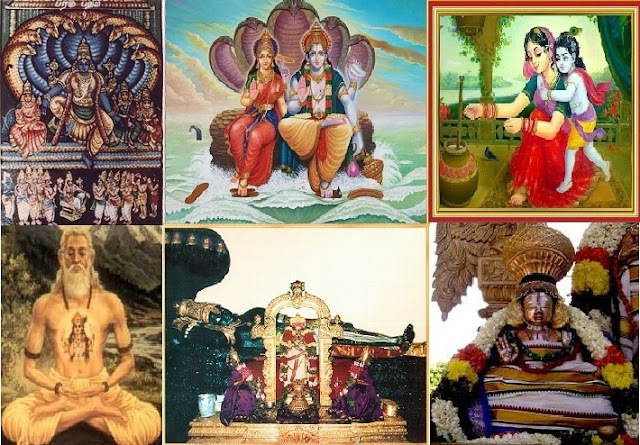 piLLai lOkAchArayar, out of his divine and causeless mercy, to uplift the jIvAthmAs, wrote many divine granthams such as thathva thrayam (http://ponnadi.blogspot.in/p/thathva-thrayam.html), rahasya thrayam (mumukshuppadi, etc), srIvachana bhUshaNam, etc., and taught the most confidential messages in a very simple manner. A year after piLLai lOkAchAryar's birth, vadakku thiruvIdhi piLLai's wife begets another beautiful child (by the divine mercy of srIranganAthan himself) and is named azhagiya maNavALa perumAL nAyanAr (in memory of srIranganAthan). He blessed us with a divine grantham named AchArya hrudhayam (which reveals the divine heart of nammAzhwAr). Thus, lOkAchAryar (nampiLLai) who was a special incarnation (of thirumangai AzhwAr) lived a glorious life. My AchAryan (mAmunigaL) said that his father thigazhakkidanthAn thirunAvIRudaiyapirAn thAtharaNNar became the sishya of nampiLLai when he was 5 years old under the guidance of his elders. Translator's note: Thus, we have seen the divine glories of nampiLLai and enjoyed the same thoroughly. It is imperative from these incidents that AchArya's mercy will ensure safe passage to paramapadham and while being here in the samsAram, sishya can be engaged in the most apt kainkaryam that is fitting his/her true identity as well.